Award winning Noe sounds like the Fusion love child of: Melissa Etheridge, Mary Chapin Carpenter, Pink and Adele. Her latest award: Wave Award Watermark Magazine's 2015 Favorite Local Performer: Musician for Tampabay/Sarasota Fl. This award is a peoples choice award. 2018 Artist on Melissa Etheridge Cruise. Lisa has a strong fan base in Tampa/St. Petersburg/Gulfport/Ft. Myers/ Sarasota areas in Florida and continues to be a remarkable presence today. Her writing skills are showcased on 3 CD's "Providence" (made with Karmic Tattoo Band 2004), "More Than Skin Deep" (made with Karmic Tattoo Band2011) as well as her early work "Beginnings" which launched her solo career 1992. 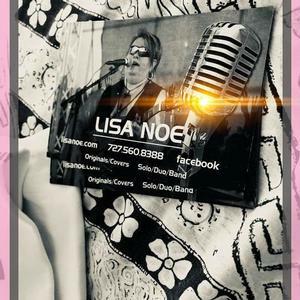 Songwriting came to Lisa at age 13 as well as her early performances with radio and local stage.